Old Palm Golf Club is unlike any other private Club community in the Palm Beaches, a fact best expressed through the extraordinary lifestyle it offers residents. This is truly âLife Well-Lived,â and nowhere is that more evident than within the intimate Club, the very heart and soul of Old Palm. The Clubâs timeless architecture and inviting interior design reflect the warmth and intimacy of a private estate. Pecky cypress ceilings, classic wool rugs and comfortable furnishings subtly enhance the ambiance. Itâs a setting that encourages Old Palmâs members to engage in conversations and join in the nonstop activities. âThe Club is always a hub of activity,â says Darlene Impellittiere, General Manager. âOur members get caught up in the excitement of our social events, and that enthusiasm carries over into every aspect of Club life. Itâs rare for a community this exclusive and private to be so incredibly fun-loving and friendly, day in and day out.â The schedule of events is remarkable, especially during the season. Parties, luncheons and charitable gatherings are frequent occurrences. In the last month alone, the Club at Old Palm has hosted a sumptuous Seafood Night dinner for members, raised more than $10,000 at a luncheon for a YWCA/Harmony House of Palm Beach County charity, and set up bungee jumping on the Clubâs event lawn, a rousing event that drew both kids and adults. Sometimes, the activities are group outings to nearby venues such as the Kravis Center, where Old Palmâs members recently enjoyed the opera âLa Traviata. âOur members can be as active and involved as they want,â adds Impellittiere. âEven if they donât participate in the scheduled events, thereâs plenty to enjoy on their own.â The Fitness Center at the Club offers countless options to stay in shape, and working out with the most advanced equipment is only part of it. Because golf is so integral to Old Palm, personal trainers are on hand to help members improve their games through golf-specific exercises. Others call on the trainers for body sculpting or core-strengthening Pilates instruction. There are also classes in everything from invigorating Zumba to muscle-toning ballet barre to water aerobics in the swimming pool. The Spa at Old Palm is just accommodating and offers a variety of services, including stress-relieving massages, aromatherapy body wraps and exuberant mineral scrubs. To ensure that residents look as good as they feel thereâs an adjoining salon for men and women. Regardless of where Old Palmâs members find themselves, the thread of impeccable service follows. The Clubâs concierge routinely arranges affairs like celebratory dinners in the private wine room. Indeed, all the Club team members take great pride in zealously fulfilling every imaginable desire, even anticipating them well in advance. 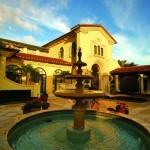 Personalized service at this level is only feasible because membership at Old Palm will never exceed 330.